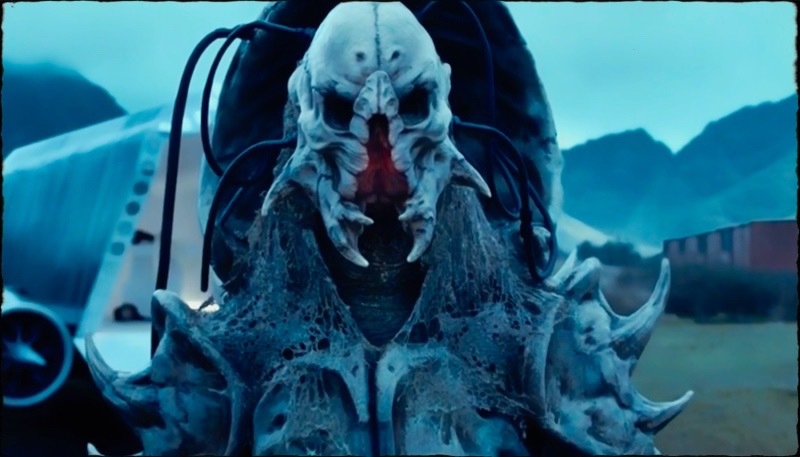 The 4th episode of Doctor Who, “Before the Flood,” is the follow up to the cliffhanger episode “Under the Lake.” Both episodes were written by Toby Whithouse and directed by Daniel O’Hara. Doctor Who seems to be trying some slightly meta approaches: speaking directly to the audience; and using one of the characters as more than a fan girl, but as a representation of the audience. In a refreshing twist, the entire crew gets to be clever and brave, not just the Doctor and Clara. Both time-travelers are called out on the way they use people. The Doctor may be committed to the greater good, but that doesn’t mean that he won’t accept a few casualties along the way. After initially playing the companion role of the moral compass who keeps the Doctor from going too far, Clara may have learned too well from her mentor to accept the necessity of a few sacrifices along the way. Doctor Who has some fun with “Before the Flood,” using some different narrative devices to give a classic story a modern makeover. 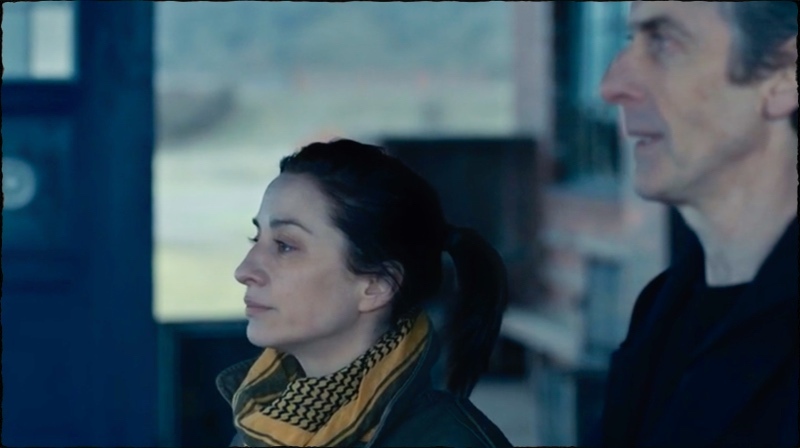 While the first half of the story “Under the Lake” was grounded in classic Doctor Who traditions, “Before the Flood” puts a slightly postmodern spin on the narrative. Although some of this circumvents questions about violations of the laws of time and space, it’s still a great ride for the viewer. A time traveler goes to 18th-century Germany to meet the beloved composer, but Beethoven doesn’t exist. Since the time traveler has all of Beethoven’s music, and cannot bear to imagine a world without his work, he publishes them and thereby becomes Beethoven. The Doctor notes that this didn’t happen, as he has meet Beethoven, who apparently loved to arm-wrestle. The Doctor asks if such a thing were to happen, then who really wrote Beethoven’s 5th symphony, giving us a few chords on his electric guitar for emphasis. The town is being used to train for offensives on military soil, so everything is written in Russian. It’s a fascinating touch to the village backdrop. The spaceship, which serves as a hearse, sits in the middle of the town, but without the mysterious markings. The Tivolian who was the original ghost in the base arrives in living form and introduces himself as funeral director Albar Prentis (Paul Kaye). Tivoli is the most invaded planet in the galaxy, as residents are proud to share with their logo, “If you’d occupied us, you’d be home by now.” The mysterious hearse spaceship contains the body of the Fisher King (played by Neil Fingleton and voiced by Peter Serafinowicz), who had conquered the people of Tivoli until they were liberated, sort of, by the Arcateenians. Arcateenian custom calls for The Fisher King to be buried on a barren, savage outpost, so naturally they chose Scotland—well, Earth, really. Back in the future, at the underwater base, Clara (Jenna Coleman), Lunn (Zaqi Ismail), and Cass (Sophie Leigh Stone) wait for the Doctor. Lunn tries to comfort Clara, who seems disconcerted by this whole being left behind thing. Cass is reading the lips of the ghost Doctor and sees that he is repeating everyone’s names, including Prentis, whom they don’t yet realize is the Tivoli ghost. The living Doctor calls Clara’s cellphone from the past. Not knowing any better, Clara tells the Doctor that his ghost is there. 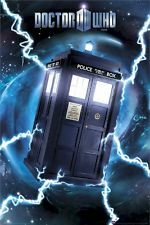 Despite foreknowledge of his death, the Doctor can’t change the sequence of future events without risking chaos and carnage across the universe. He seems surprisingly willing to accept his fate, noting, “Ah, well, I’ve had a few good innings. This regeneration is a bit of a clerical error anyway. I’ve got to go sometime.” Clara, on the other hand, is not so willing to sit back and watch the Doctor die, and protests, “NOT WITH ME! Die with whoever comes after me. You do not leave ME.” The Doctor tells Clara that everyone has to face death eventually, whether it’s their own or someone else’s. It’s not clear if he’s talking about his own impending death or Danny Pink’s past death—either way, Clara’s not ready. Clara tells him that if he loves her in any way he’ll come back to her, and her speech has some impact on him. The Doctor asks Clara for clues about his death, and she notes his jacket is torn. Just then the Doctor’s ghost comes into the room and turns off the Faraday cage, releasing the ghosts. The live Doctor addresses the ghost Doctor, though Clara’s phone and his message changes to “The Chamber will open tonight.” It all sounds very Harry Potter, but the Doctor tells Clara that they must enter the Faraday cage, leaving her phone outside the chamber where she can see if he contacts her. The Doctor wants O’Donnell to stay behind in the TARDIS, but she refuses. They go to the spaceship and find Prentis dead and the letters inscribed on the spaceship wall. The Fisher King has risen and taken the suspended animation chamber into the church. They hear him roar and run. O’Donnell separates from the Doctor and Bennett, and is killed. Bennett runs to her and they have a sad good-bye. It turns out that the names the ghost Doctor is speaking is a list of who is going to die, in order. Bennett has worked it out too and accuses the Doctor of not trying very hard to save O’Donnell in order to test his theory. Bennett asks who is next on the list and the Doctor tells him it’s Clara. Bennett angrily responds, “Yeah. Except now you’re going to do something about it, aren’t you? Because it’s getting closer to you. You’re going to change history to save yourself but not to save O’Donnell. You wouldn’t save her.” The Doctor says he’s changing history not to save himself, but to save Clara. Bennett walks away, disgusted. This isn’t the first time that someone has called the Doctor out on his selective rescue efforts. Back in the TARDIS, the Doctor tells Bennett they’re going off the map:“I’m going to go back to the base and I’m going to save Clara because that’s what I do, and I don’t see anyone here who’s going to stop me.” Just then the TARDIS makes a disconcerting noise. So apparently there is something that will stop the Doctor because he finds himself locked in his own time-stream. They find themselves back in the village, 30 minutes prior. Naturally Bennett wants to warn Prentis and O’Donnell, but the Doctor insists they cannot: You can’t cheat time, I’ve just tried. You can’t just go back and cut off tragedy at the root.“ In another Harry Potteresque moment they watch themselves meeting Prentis for the first time. In the village, the Doctor realizes he must face the Fisher King. The Doctor tells the Fisher King he has come from the future and has seen the chaos and bloodshed he has created. The Fisher King says his ghost will bring an armada that will wake him from his sleep and enslave the earth. The Doctor protests that the earth is protected by him. The Fisher King responds, “Yes. One man, lost in time. The seed of their destruction is already sown. They will die, the message will be sent, my people will come, and you will do nothing to stop it… Time Lord.” The Fisher King is quite familiar with the warlike Time Lords. He finds the Doctor’s efforts to protect time and history, even with his own death, curious. At the underwater base Lunn has a terrifying moment where he’s surrounded by the ghosts. They examine him and then stand back and let him pass. He finds the cell phone but the doors lock behind him. Cass is no longer willing to wait for Lunn in the Faraday Cage. She and Clara leave together to find him. Bur Cass leaves Clara to go off on her own. The Moran ghost follows Cass, dragging along an axe, but she cannot hear it. She does feel it though and manages to get away before he can kill her. Cass comes upon Clara and they find Lund in the cafeteria. He tells them it was a trap, and all the ghosts appear in the room. They run for the Faraday Cage. The Doctor tells the Fisher King that he’s already gotten rid of the words so that none of what he saw in the future will come to pass. The Fisher King goes out to the spaceship and finds the words still inscribed on the wall and one of the ship power cells missing, commenting, “The Time Lord lied.” A power cell explodes at the dam above the town. The TARDIS, with Bennett still inside, goes into emergency response and departs. The Fisher King looks up in time to see the water rush in. At the underwater base Clara, Cass, and Lunn run from the ghost. They enter the bay and the suspended animation chamber begins to open, from which the Doctor emerges. The Doctor ghost uses the call of the Fisher King to lead the other ghosts into the Faraday Cage, then the Doctor ghost disappears. The Doctor ghost had been a hologram all along, generated from the suspended animation chamber once it was brought on board. 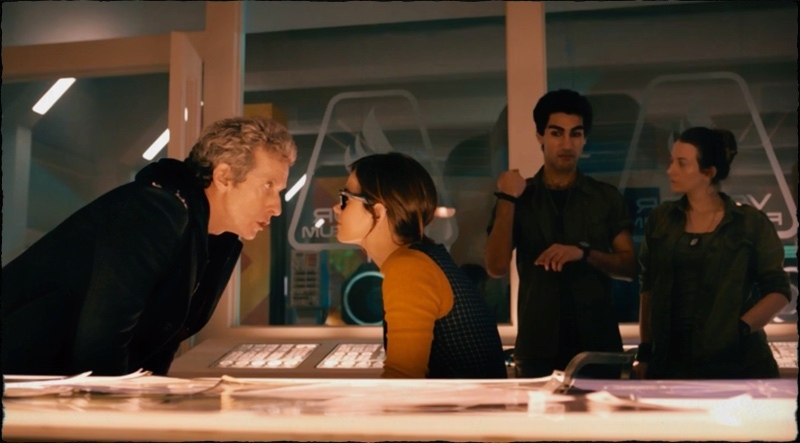 The Doctor uses his sonic sunglasses to erase any memory of the words among the crew, plus maybe a few more. The crew finds Bennett standing outside the Faraday Cage watching the O’Donnell ghost. When he asks what he is to do now, Clara speaks to him from the experience of her own loss, telling him that he has to keep going. Bennett tells Lunn to sign something to Cass for him–that Lunn is in love with her and there’s no point in wasting time. When he signs her the message she responds positively. UNIT will be dragging the Faraday Cage away, allowing the ghosts to eventually disperse. 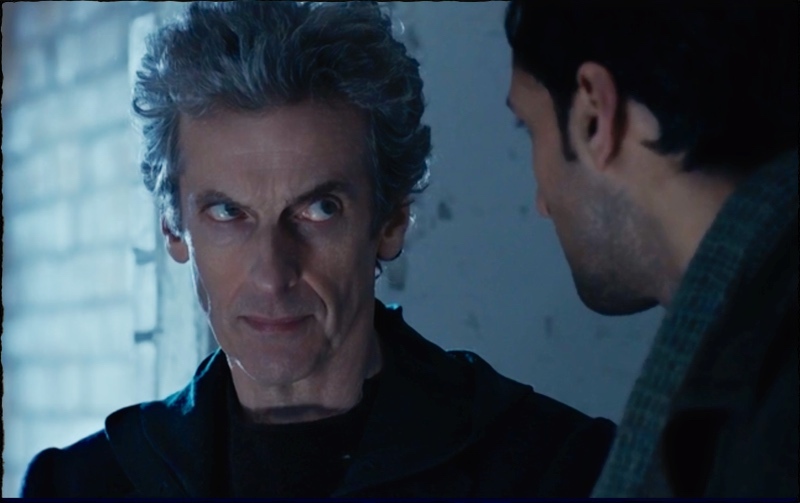 The Doctor tells Clara that he was reverse engineering the narrative. He programmed his ghost hologram to say the list because that’s what his ghost had said, and he only created it because he saw it at the underwater base. When she realizes the circular nature of what happened, Clara says, “Wow.” The Doctor asks, “Exactly. Who composed Beethoven’s 5th?” He then looks directly into the camera and we hear electic guitar strains of the 5th symphony. 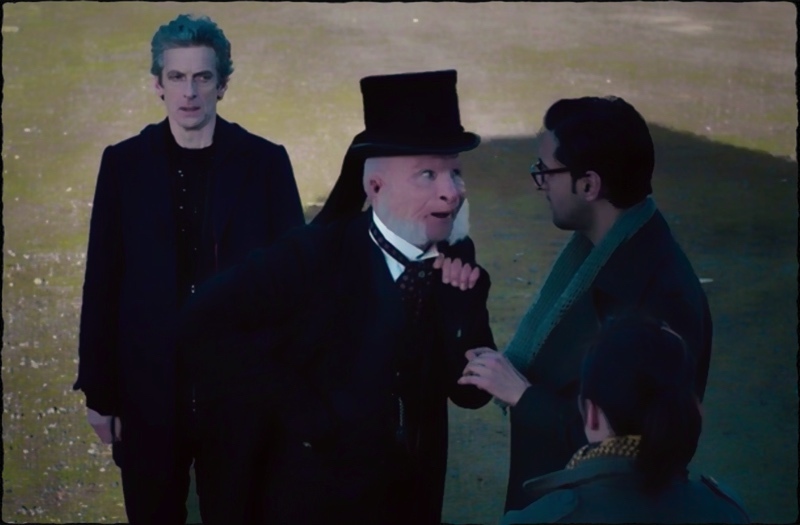 Together, “Under the Lake” and “Before the Flood” gave us some great Doctor Who storytelling. “Under the Lake” gave us a classic tale, while “Before the Flood” subverted the narrative. A show that has been on the air for over 50 years has great traditions. We appreciate how Doctor Who considers when to embrace tradition and when to turn it on its head.